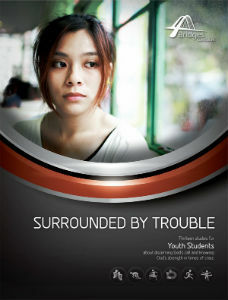 Surrounded by Trouble is a new thirteen-week elective study published by Warner Press to help teens answer these challenges with faith and hope. Written for middle-school and high-school students, the undated study can be used in groups of any size. Surrounded by Trouble begins with the experience of Jeremiah, a young man through whom God spoke in a similar time of crisis. Other sessions consider how God encouraged Ezekiel, Job, and the apostle John when they faced personal disaster and social unrest. The book reveals that God may call us to make radical changes in our lives so we can meet such challenges with resilient faith. The book and a companion multimedia CD are available from Warner Press. Order online at www.warnerpress.org or call toll-free 800-741-7721. This entry was posted in All Church of God, Youth Ministries and tagged Bible, book, current events, curriculum, discipleship, news, small group, study, Sunday school, world, worry, youth. Bookmark the permalink.